Change seems to be Anthony Hamilton Russell's watchword. Since taking over in the early nineties he has changed the vines, the method of farming, and - in conjunction with some stellar winemakers - the quality. Employees have become so besotted with the valley and its potential that they leave to set up their own wineries. 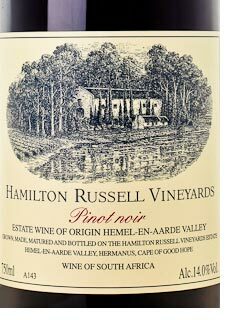 Among them are Newton Johnson, Hannes Storm and Ataraxia , all seeded by Hamilton Russell. Even during the three drought years culminating in 2017, Hemel-en-Aarde had more rain than London and that suits the clay, shale and granite ridges. In 2015 as part of a continuing commitment to their shallow soils and the rest of the estate they converted to organics, including the use of 'good' fungus to combat the bad ones rather than covering the land with copper.